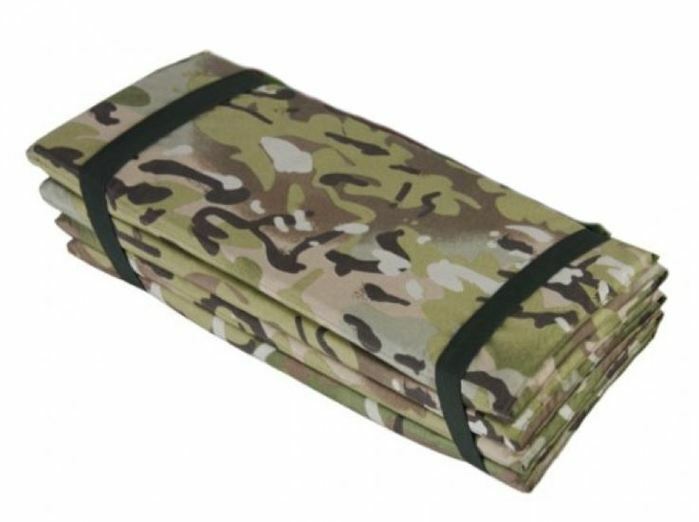 We are pleased to offer these lightweight camouflage folding sleeping mats. PU Coated waterproof polyester fabric in british MTP style camo print. Opened out measures 185cm x 48cm, yet folds away quickly into a handy cube measuring only 48cm x 8cm - secured by two elastic straps. Perfect as a snipers mat for prone-position shooting, or as a regular camping mat to provide insulation on cold ground. Easy to carry, would even fit inside a large rucksack, so much better than the basic foam roll-mats on issue to basic recruits etc. When folded away it provides a convenient seat etc for sitting round the camp fire prior to bed!